Screw it! I'm doing two beers! I'm doing beer! Honey woke to the sensation of being rocked. She opened her eyes only to immediately shade them as the sun caused her headache to make a return. As she lifted a hoof to rub her temples, Luna’s yellow eyes glanced down at her. Momentarily confused, Honey glanced around and saw the surrounding rocks and trees gliding by and realized Luna was carrying her. “She’s awake,” the Hellhound declared. Izar and Rain halted and turned. “I feel alright,” Honey grumbled, still rubbing her forehead. 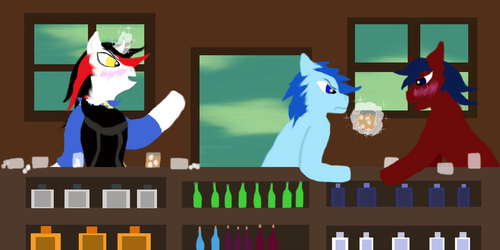 “Kinda have a headache, but I don’t feel weak anymore.” Rain trotted up and took Honey’s hoof. So! Some of us in the MLP fandom had the idea that Starswirl the Bearded turned into Discord somehow. I thought it was a cool idea and decided to make up a little backstory piece based on the theory. This piece and the story are also based on and inspired by a song by Lord Huron called "The World Ender". I did a piece with Discord a while back but wanted to update it because my first drawing of Discord wasn't that great. I based this design of Discord on his show design and also on the design of Eastern dragons, except for the wings, since Eastern dragons don't have those. I also mention Zebrica, which is the name of the zebras' homeland from a fan-created informational series on Equestria, its surrounding lands and history and their denizens. I'd recommend it and will link to Historical Equestria here. Anyhow, here is the story and the song will follow. I will provide music information and reference links after those. Hope you enjoy! I didn't do Discord's hind right leg the right way but I love giving animals and creatures deadly claws. 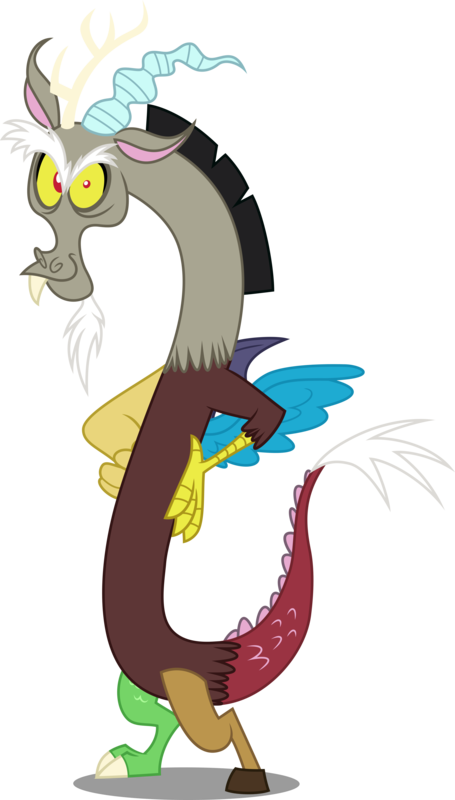 Discord does look kinda goofy at first glance but the show probably can't delve too much into how deadly he can probably be. In an attempt to take over Equestria and get Princess Celestia, Princess Luna and their mentor Starswirl the Bearded out of the picture, Lord Tirek began planning. He decided to start with Starswirl, as he was the one who had taught the Princesses, and surely by getting rid of the unicorn, Tirek would start to break down the Princesses' spirits. 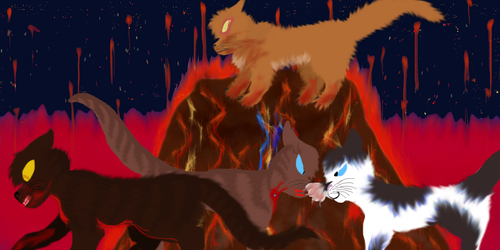 Tirek knew confronting any of the ponies head on would only result in his own demise. Despite Starswirl's cool and collected demeanor and devotion to knowledge and travel, the talented unicorn was very loving and had a kind and talented Weather Pegasus named Moonbow as a wife, and a unicorn filly named Starshine. Tirek made the decision to target Starswirl's family while he was away on a diplomatic voyage to Griffonstone on the Princesses' behalf. When Starswirl had gone, Tirek went to Starswirl's home and set it ablaze, his heart cold to the family he was destroying in his selfish, monstrous bid for power. Celestia and Luna saw the family's house ablaze and rushed immediately to help, but alas, they were too late. They attempted to contact Starswirl, who cut his goodwill ambassador mission to Griffonstone short. 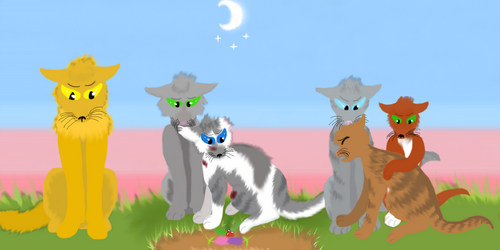 Starswirl, Celestia and Luna didn’t know it was Tirek who had done the horrible act. When a broken and grieving Starswirl could not be comforted by the Princesses, he silently slipped out of Canterlot during the night, setting off on his own to gather his thoughts and deal with his grief alone. He was unknowingly being closely watched by Tirek, who waited until Starswirl was too far away from any help, and revealed himself as the one who had killed the unicorn's family. 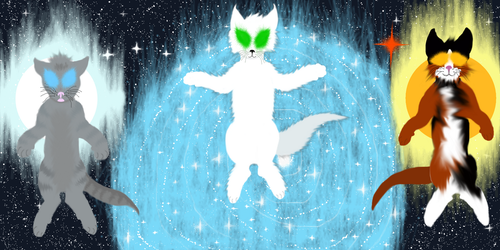 Starswirl grew enraged and fought Tirek valiantly, using his extensive and powerful magic. Though Starswirl at first had the upper hand, Tirek eventually saw an opening, which he swiftly took advantage of to drain Starswirl's magic. 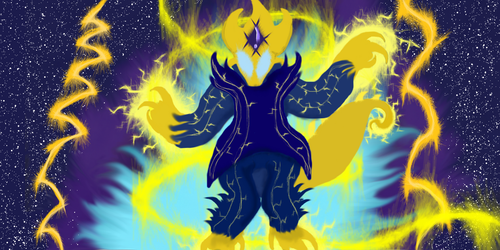 Weakened, injured and sorrowful, Starswirl was cursed by Tirek to become a Draconequus, an ancient and powerful Spirit of Chaos. Tirek’s dastardly and cruel ploy had worked. When the Princesses discovered their mentor was missing, they swiftly struck out to find him. 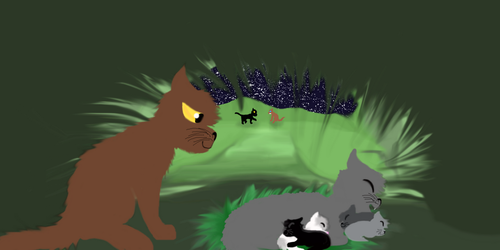 Starswirl, now the Spirit of Chaos, managed to stumble his way back to the Princesses, disoriented, heartbroken and battered from the fight with Tirek, his mind a blur and weakening by the moment. His memories were fading and his heart was closing, causing him to lose sight of who he'd been. By the time he got back to Canterlot, he'd further lost his mind in his weakened and grieving state. He began unleashing his fury and sorrow on Equestria. When the Princesses heard of a strange creature raining destruction on Equestria, they grimly knew they had to abandon their search for Starswirl and protect their subjects. They first attempted to defeat Discord with their own power, but were unable to. When they retreated Discord turned Equestria into his Land of Chaos. Celestia and Luna returned to Canterlot to retrieve the Elements of Harmony, healed their most serious wounds, then confronted Discord a final time. Unaware that Starswirl had been cursed by Tirek and was now Discord, the Princesses used the Elements of Harmony and turned their beloved former mentor into a stone statue. Shocked and anguished at losing Starswirl, Moonbow and Starshine, Equestria went into mourning. A service for the family was held, which most of Equestria attended. Many citizens from Saddle Arabia, Zebrica, and Griffonstone attended to pay their respects and give the Princesses their condolences, for Starswirl had been a well-traveled, learned, respected and loved citizen of Equestria. Losing Starswirl had a consequence Tirek hadn't intended, but one he was satisfied with regardless. 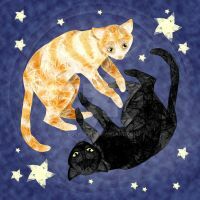 Starswirl, Celestia and Luna often stayed up at night to observe the skies and make various types of star charts. They also witnessed many meteor showers and even discovered a few new celestial bodies. Celestia gradually got too busy to join them as frequently. After Starswirl was gone, Luna had no one to share the night with, and the grief over her mentor and friend's loss became too much, eventually contributing to her change into Nightmare Moon. 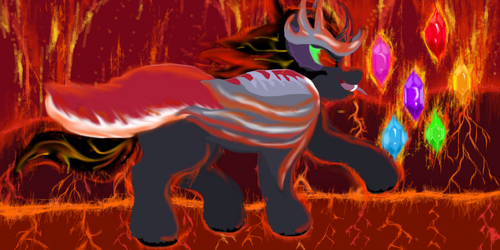 When two obstacles to power were gone, Tirek gathered resources, made plans and finally challenged the lone Celestia. He revealed during the battle that it had been him who'd killed Moonbow and Starshine and cursed Starswirl. Enraged, Celestia fought even harder to avenge all she'd lost. At last, exhausted, wounded and her magic almost spent, Celestia gained the advantage and banished Tirek to Tartarus for his crimes. One night, as Celestia was recovering, she was observing the stars. 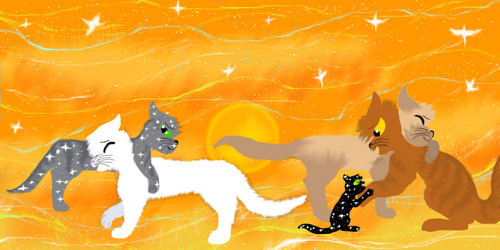 Starswirl had taught both sisters that future events could be glimpsed in the stars if one knew how. That was when Celestia learned Luna would come back in a thousand years, and she vowed to make things right with Luna and eventually with Starswirl, even though he wouldn't remember her. They took my life but it isn't the end, no! Oh, when The World Ender comes, baby, run for your life! I'll tear through the night and I'll raise up Hell! 'Cause I'm The World Ender, baby, and I'm back from the dead! Screaming through the night like a demon child! And the noise in the night is gonna get a little louder! Oh, I'm The World Ender Baby, and I'm back from the grave! Oh, they can run for their lives but they cannot be saved! I'm The World Ender baby, and I'm coming for them! Oh, they put me in the ground, but I'm back from the dead! Princess Celestia from My Little Pony in wolf form. 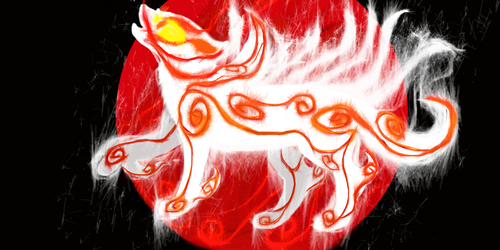 Though she kinda just looks like regular Amaterasu from Okami. And I think this piece was kinda messy, so I may redo it in the future. 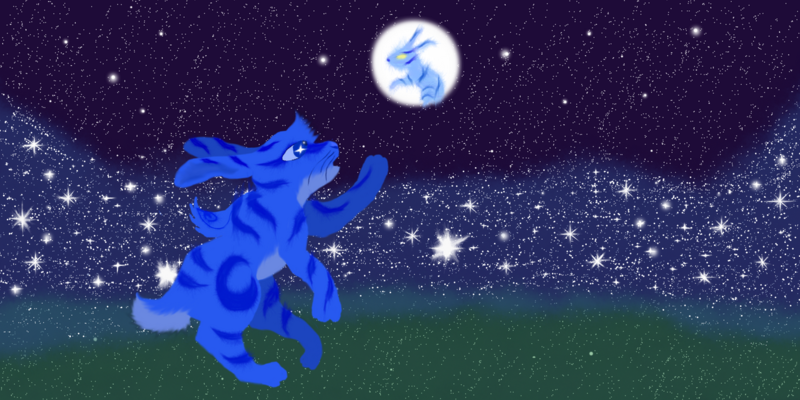 Princess Luna in bunny form next to The River of Stars (milky way) up in the sky. I gave her the form of Yumigami from the Clover Studios game Okami. There are thirteen Brush Gods in the game and they are all white with red celestial markings. 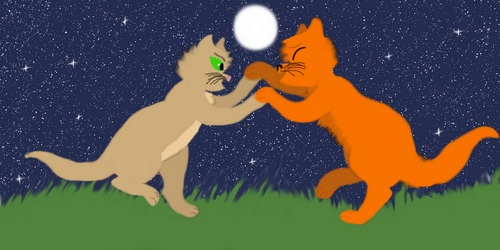 As you can see I changed the color scheme to fit Luna. In the game, Yumigami is the Goddess of the Moon and she takes the form of a rabbit with a big honkin' rice cake mallet. Also, over in Japan, instead of a man or a whatever in the moon, it's a rabbit in the moon making rice cakes. I didn't give Luna Bunny a mallet and I made her look more like a hare, but anyway, here we are! Celestia's next. I'll probably try drawing her as a wolf, since in the game the Japanese Sun Goddess Amaterasu takes the form of a wolf and the Dog place in the Zodiac. 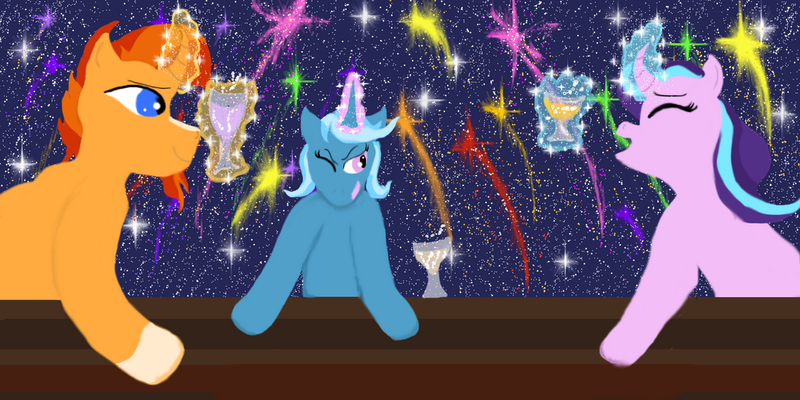 A follow-up to a piece I did while back with Trixie and Starlight, but this time it's a happier visit and Sunburst was invited to go with Trixie and Starlight to the Moon Festival, which takes place the night before the Summer Sun Celebration. Trixie decides to add some of her own fireworks to the Summer Sun Celebration display. Starlight's drinking a Lemon Drop and Trixie and Sunburst are drinking wine. You swore and said, "We are not...we are not shining stars." "This I know; I never said we are. I've closed enough windows to know you can never look back." But my legs are fine! After all, they are mine! Show me how no one's ever gonna stop us now! No one's ever gonna stop us now!